Small business can gain a lot from CRM software, but how do you choose the best CRM for small business needs? 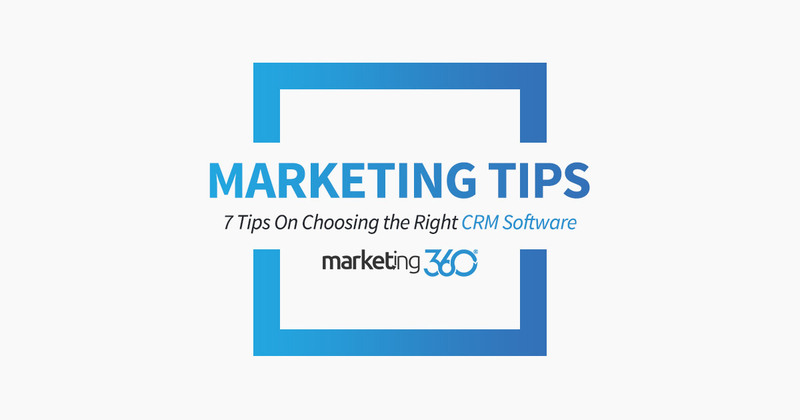 Here are some tips on how to evaluate CRM software with an overview of the free CRM offered by Marketing 360®. There can be a great of work involved in migrating data, importing contacts, and integrating systems into a CRM. We’ve had people come to us where they grabbed a free or low-cost software deal, but then had no real idea how to set the thing up. It isn’t unusual to hear about this going on for months, and sometimes businesses never even get to the point where they can actually use the CRM. Avoid this pointless waste of time and effort. At Marketing 360®, we have a dedicated support team to make sure businesses can properly use our tools, and they’re all part of our free CRM solution. A real irritant with CRM software is to get a solution that changes pricing depending on how much you use it. Worst case is when the company charges you more when you add more contacts to the system. CRM software is not a taxi cab. You want to be able to use it freely, without the constraint of the price going up just because you’re utilizing it the way it was designed. Check this very carefully. CRM software should be inexpensive and unlimited in use. Anything else and you’ll be spending more than you should. We’ve all felt the frustration of calling into general support centers and dealing with people who, frankly, can’t handle our specific problem. If you can get a CRM solution that has a dedicated support team, you won’t have that issue. A CRM specialist will be able to help with integration, glitches, and general questions. Perhaps most important, they can advise you how to use the software to your advantage so that it’s fully adopted by your staff. Another problem many small businesses have with CRM initiatives is that people are set in their ways, and don’t want to switch from their personal record keeping process. However, it’s vital that everyone has buy-in with your CRM, and that everyone use it consistently. A big reason you need a CRM is to ensure all your customer data is formatted and available – to everyone. If just one person breaks the link in this chain, your customer service will suffer. When you onboard your program, a dedicated CRM pro can guide your small business with best practices. Soon, you’ll wonder how you ever lived without it. CRM software is not new, but solutions that are tailored to small business needs are. Be careful when selecting a CRM so that you don’t get something designed for the needs of an enterprise or large, multi-location organization. It’s easy to get a tool that’s actually far more feature rich than you need, which can be a bigger problem than you might think. If your CRM is too complex, you’ll have problems getting people to use it accurately and consistently. This, unfortunately, defeats the purpose of having a CRM. It’s essential that everyone in your company know how to use the tools so that all the customer information is accurate and updated. Here is a complete overview of our small business CRM software interface. We’ve all heard the story of the lost client because Chuck in sales put notes of a vital contact in his yellow pad instead of the CRM…it’s all or nothing with these tools. Get what your company needs and can consistently use, but no more. With email automation being such a big part of digital lead-nurturing and client retention, it only makes sense that CRM and email software would integrate. And it does make sense when they operate on one platform like Marketing 360®. However, many CRM solutions don’t have this integration built in. The point is, as you create automated email journeys for marketing campaigns or even as you send clients individual emails, this should be recorded in communication records of the client. Manually having to do this is archaic, and integrating disparate systems is inconsistent. Email and CRM software are, at this point, pretty much like pancakes and syrup. They should just come together without you having to ask. While it’s true that you don’t want a complex tool laden with unneeded features, it’s also true that you want the power your business needs. One such feature is the ability to create custom reports. This allows you to create categories and associate contacts with products, services, or campaigns that are distinct for your business. For example, an eCommerce business might want to create a list of clients that bought a particular product the previous year. A project manager might want reports on clients who’ve selected a particular feature for their project. Custom reports allow you to categorize contacts under any criteria you need to. Pretty handy for most businesses. At this point, this should pretty much go without saying, but you do need to make sure you can use your CRM on your phone. It’s likely you have people in the field who’ll need to access the CRM. You may be working from a coffee shop or at home on the couch. Phone time. Let’s face it. Any type of serious business software today needs to be mobile friendly. If it’s not easy to use (meaning specifically designed to use) on your phone, it won’t be worth it. CRM software is one of the more valuable tools small businesses can use today. It’s easy to use, does a great deal to help you stay organized, and it’s inexpensive. In fact, our CRM software is free to use, with free support. We make that offer in the hopes that this tool will help your business grow so that we might partner up with you on other marketing services. For a free demo of any of our software, contact one of our marketing consultants today.